Published: Jan. 1, 2008 at 03:31 p.m.
To be successful against the Giants, Tampa Bay has to block their front four -- and Umenyiora is their best player. Garcia has to move around and make some plays outside the pocket. 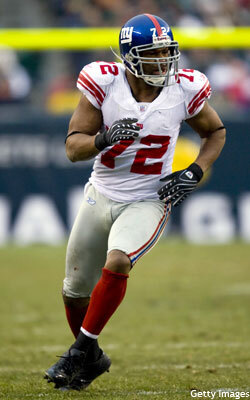 Umenyiora has 13 sacks for the season and is an outstanding pass rusher, and he is also very good against the run. The question is: Did the Giants play so hard against the Patriots on Saturday night that they will have a hard time getting that same intensity here against a rested Tampa Bay team? Garcia is the player who makes Jon Gruden's offense go. He is very smart, and he doesn't make mistakes that cost his team games. He just wins games, like he did late last year for Philadelphia. And Garcia is already 2-0 in playoff games against the Giants -- having beaten them in the postseason with the Eagles last season and the 49ers back in 2002.